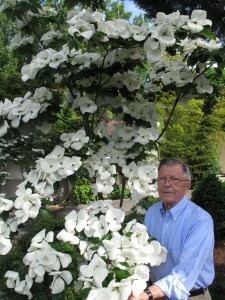 Dr. Elwin Orton standing next to a Rutgers Venus® dogwood tree. Professor Elwin Orton spent over 40 years breeding plants for improved qualities – first with hollies, then with dogwoods. Dr. Orton has developed an international reputation for his efforts in plant breeding programs of the Rutgers New Jersey Agricultural Experiment Station (NJAES) and has received over 20 awards from garden clubs, horticultural groups, nurseries, plant breeding societies, and landscaping associations for his outstanding work. During the 1970s, native American dogwoods (Cornus florida), were under serious attack from insects and diseases and the future of dogwoods used in landscaping was in jeopardy. Of concern was widespread infection of dogwood anthracnose that resulted in extensive damage to trees in both native woodlands and ornamental landscapes. Additionally, dogwood borer was causing serious problems to the health of the American dogwood. 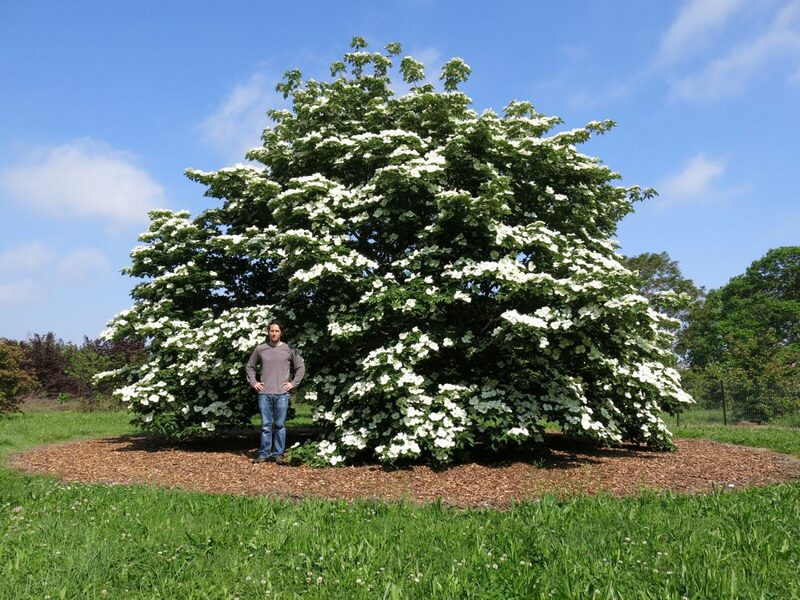 To address concerns for use of dogwoods in landscapes, Orton had a plan to cross-breed the native American dogwood tree with the hardier Asian species, Cornus kousa (commonly called Kousa dogwoods), thus producing a new and unique hybrid tree. As a result of this strategy, along with plant breeding skills and patience, he was rewarded with a much improved dogwood tree. As a result, the first series of Rutgers dogwoods was released to market in the early 1990s. Professor Tom Molnar now continues the dedicated work that began in the 1970s. He joined the Department of Plant Biology in 2004 and soon began working alongside Orton, conducting research for the NJAES. Molnar is currently in charge of the Rutgers dogwood tree breeding program and, like Orton, expanded his vision to focus on a hazelnut breeding program, as well. His main focus is breeding plants for improved qualities – first with dogwoods, then with hazelnuts. Dr. Molnar is proud to carry on the legacy of Dr. Orton and conduct valuable research at Rutgers University. 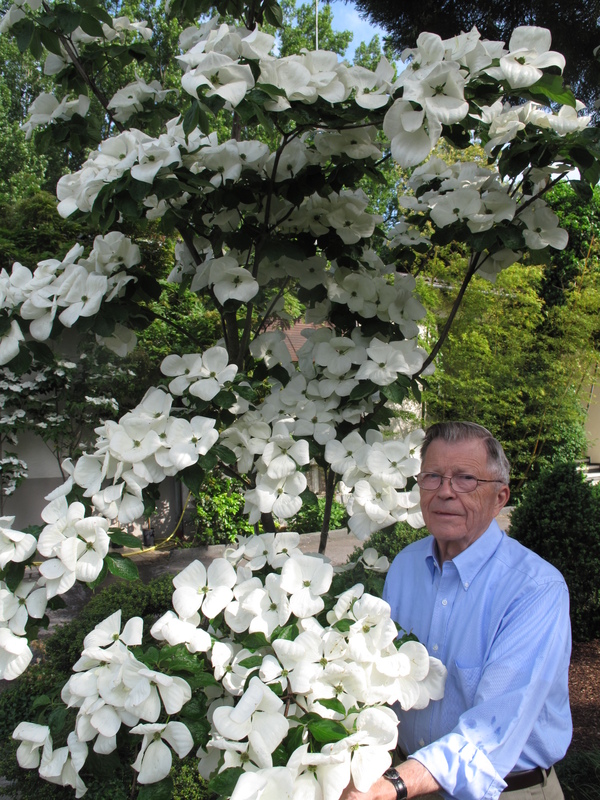 Dr. Tom Molnar standing by a Rutgers Venus® dogwood tree. The newest release from the dogwood tree breeding program is the ‘Rutpink’ Scarlet Fire® dogwood. See Dogwood Tree Varieties for more information.